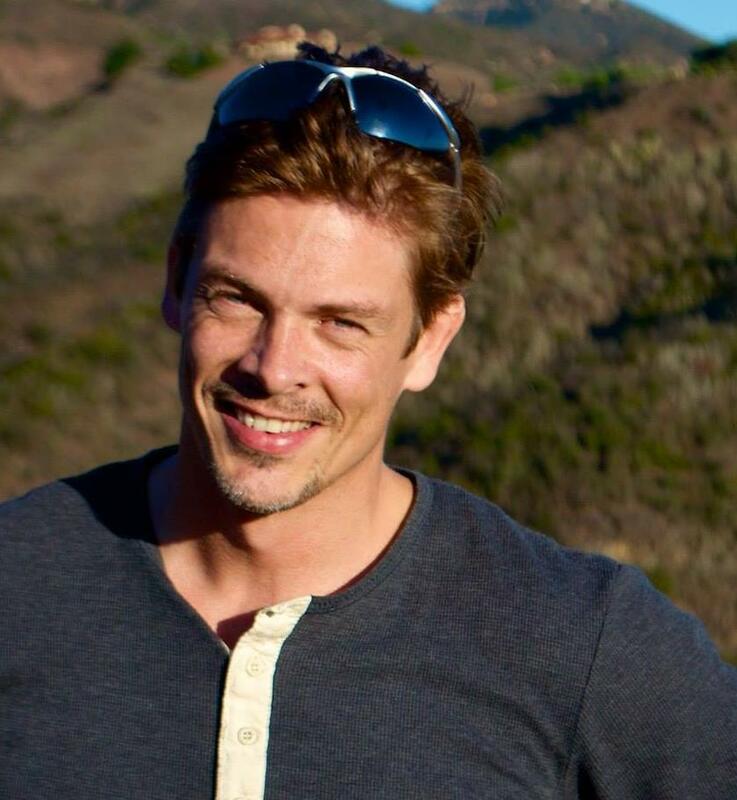 Dear Dr B: What does the universe expand into? “When the universe expands, into what is it expanding? In what medium is it expanding? Is the universe like a bubble in a higher dimension something? 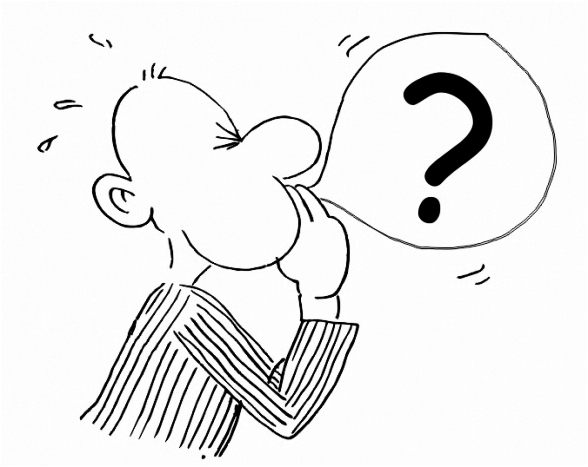 This is a very good question and one, I should add, I get frequently. It is, I believe, to no small part caused by the common illustrations of a curved universe: it’s a rubber-sheet with a bowling-ball on it, it’s an inflating balloon, or – in the rarer case that someone tries to illustrate negative curvature, it’s a potato chip (because really I have no idea what a saddle looks like). But in each of these cases what the illustration actually shows is a two-dimensional surface embedded in a non-curved (“flat”) three-dimensional space. That’s good because you can draw it, but it’s bad because it raises the impression that to speak of curvature you need to put the surface into a larger space. That, however, isn’t so: Curvature is a property of the surface itself. To get an idea of how this works, consider the simplest example of a curved surface, a ball. On the ball’s surface the angles of triangles will not add up to 180 degrees. You can calculate the curvature from measuring all the angles in all triangles that you could draw onto the ball. This is a measurement which can be done entirely on the surface itself. Or by ants crawling on the surface, if you wish, to use another common analogy. Curvature, hence, is an intrinsic property of the surface – you do not need the embedding space to define it and to measure it. Also note that the curvature is a local property; it can change from one place to the next, just that a ball has constant curvature. 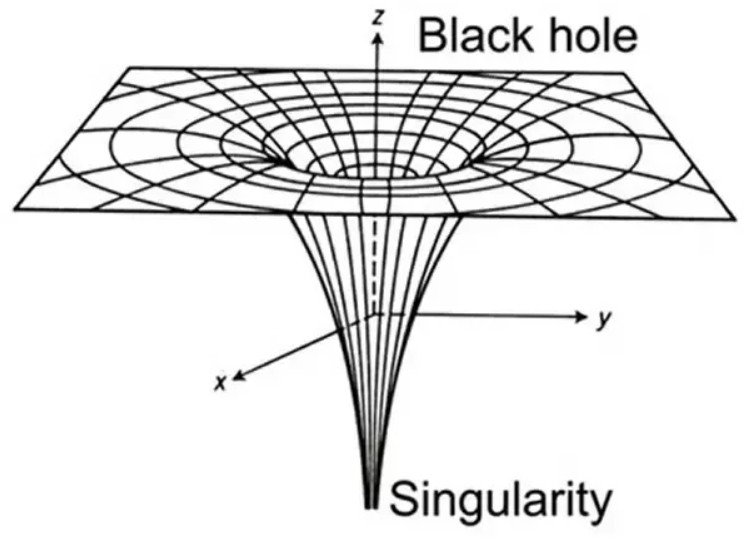 General relativity uses the same notion of local, intrinsic curvature, just that in this case we aren’t dealing with two dimensions of space and ants crawling on it, but with three dimensions of space, one dimension of time, and humans crawling around in it. So the math is more complicated and all the properties of space-time are collected in something called the curvature-tensor, but that is still an entirely internal construct. We can measure it by tracking the motion of particles, and it’s this curvature that creates the effect we usually refer to as gravity. Now, what cosmologists mean when they speak of the expansion of the universe is a trend of certain measurement results that, using Einstein’s equations, can be interpreted as being due to an increasing distance between galaxies. Again, this expansion is an entirely internal notion. It is defined and measured in our universe. You do not have to embed this four dimensional space-time into anything else to quantify it. You do not need a medium and you do not need a larger space. Einstein’s theory is entirely self-contained with a four-dimensional, internally curved space-time. While you do not have to embed space-time in a higher-dimensional flat space, you can. Indeed it can be mathematically proved that you can embed any curved four dimensional space-time into a ten dimensional flat space-time. The reason physicists don’t normally do this is that these additional dimensions are superfluous and they don’t aid the math either. Only the surface itself has physical meaning. The surrounding space is for visual purposes. can be useful to visualize the extrinsic curvature of certain slices of space-time. This is, for example, what gives rise to the idea that when matter collapses to a black hole, space develops a long throat with a bubble that eventually pinches off. But please keep in mind that these are merely visual aids. They have their uses as such, but one has to be very careful in interpreting them because they depend on the chosen embedding. Now you ask what does the universe expand into? It doesn’t expand into anything, it just expands. That the universe expands is a statement about what happens inside the universe, supported by measurements inside the universe. It’s an entirely internal notion that does not require us to speak of an outside of the universe or a medium into which it is embedded. I’ll be traveling the next two weeks. First I am in Santa Fe, giving both a colloquium and a public lecture, and then I am in Oslo, giving two talks, one at the Kavli Symposium and one at the public library. Later in September I’ll be in London at HowTheLightGetsIn. The first week of October, I’ll be in NYC and afterwards in Lexington, Kentucky. The week after that I’ll be at the international book fair in Frankfurt, and in early November I’ll be in Berlin (details to come). I have been advised that giving talks about my book is private business, so please note that the next two weeks I am officially on vacation for the first time since 2008 (which was our two-years-late honeymoon trip). Vacation or not, it is foreseeable that I will be offline for extended periods, so please prepare for a slow time on this blog. According to Penrose’s conformal cyclic cosmology, the universe goes through an infinite series of “aeons,” each of which starts with a phase resembling a big bang, then forming galactic structures as usual, then cooling down as stars die. In the end the only thing that’s left are evaporating black holes and thinly dispersed radiation. Penrose then conjectures a slight change to particle physics that allows him to attach the end of one aeon to the beginning of another, and everything starts anew with the next bang. 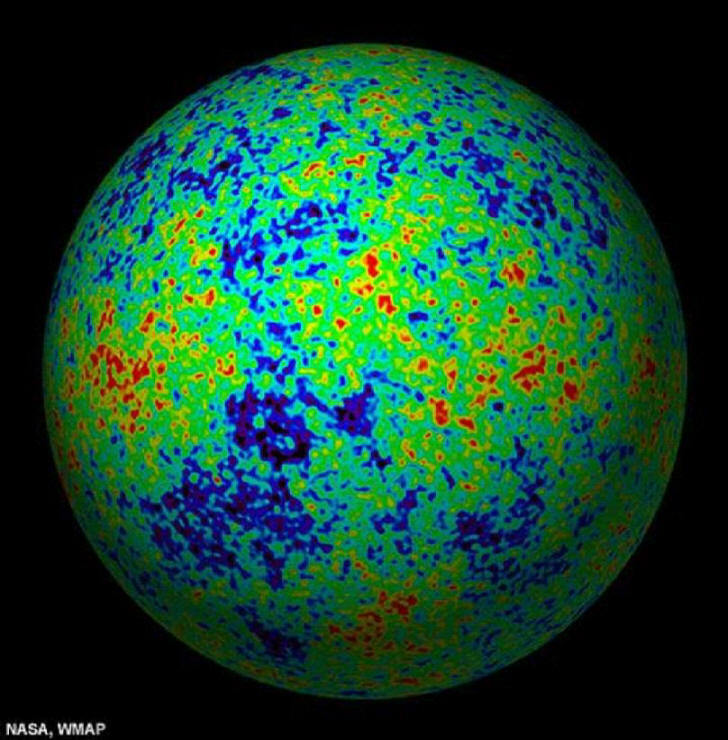 If Penrose’s CCC hypothesis is correct, we should also be able to see some left-over information from the previous aeon in the cosmic microwave background around us. To that end, Penrose has previously looked for low-variance rings in the CMB, that he argued should be caused by collisions between supermassive black holes in the aeon prior to ours. The search for that, however, turned out to be inconclusive. In a recent paper with Daniel An and Krzysztof Meissner he has now suggested to look instead for a different signal. The new signal that Penrose et al are looking for are points in the CMB at the places where in the previous aeon supermassive black holes evaporated. He and collaborators called these “Hawking Points” in memory of the late Stephen Hawking. The idea is that when you glue together the end of the previous aeon with the beginning of ours, you squeeze together the radiation emitted by those black holes and that makes a blurry point at which the CMB temperature is slightly increased. Penrose estimates the total number of such Hawking Points which should be in the total cosmic microwave background is about a million. The analysis in the paper, covering about 1/3 of the sky, finds tentative evidence for about 20. What’s with the rest remains somewhat unclear, presumably too weak to be observed. They look for these features by generating fake “normal” CMBs, following standard procedure, and then trying to find Hawking Points in these simulations. They have now done about 5000 of such simulations, but none of them, they claim, has features similar to the actually observed CMB. This makes their detection highly statistically significant, with a chance of less than 1/5000 that the Hawking Points which they find in the CMB are due to random chance. Quite a collection of mights and coulds and oughts. Like Penrose, I am not a big fan of inflation, but I don’t find conformal cyclic cosmology well-motivated either. Penrose simply postulates that the known particles have a so-far unobserved property (so the physics becomes asymptotically conformally invariant) because he wants to get rid of all gravitational degrees of freedom. I don’t see what’s wrong with that, but I also can’t see any good reason for why that should be correct. Furthermore, I can’t figure out what happens with the initial conditions or the past hypothesis, which leaves me feeling somewhat uneasy. TH:Let me start by asking why discussions about the nature of time should matter to the layperson? CR: There is no reason it “should” matter. People have the right to be ignorant, if they wish to be. But many people prefer not to be ignorant. Should the fact that the Earth is not flat matter for normal people? Well, the fact that Earth is a sphere does not matter during most of our daily lives, but we like to know. TH: Are there real-world impacts with respect to the nature of time that we should be concerned with? CR: There is already technology that has been strongly impacted by the strange nature of time: the GPS in our cars and telephones, for instance. TH: What inspired you to make physics and the examination of the nature of time a major focus of your life's work? CR: My work on quantum gravity has brought me to study time. It turns out that in order to solve the problem of quantum gravity, namely understanding the quantum aspects of gravity, we have to reconsider the nature of space and time. But I have always been curious about the elementary structure of reality, since my adolescence. So, I have probably been fascinated by the problem of quantum gravity precisely because it required rethinking the nature of space and time. TH: Your work and your new book continue and extend the view that the apparent passage of time is largely an illusion because there is no passage of time at the fundamental level of reality. Your new book is beautifully and clearly written -- even lyrical at times -- and you argue that the world described by modern physics is a “windswept landscape almost devoid of all trace of temporality.” (P. 11). How does this view of time pass the “common sense” test since everywhere we look in our normal waking consciousness there is nothing but a passage of time from moment to moment to moment? CR: Thanks. No, I do not argue that the passage of time is an illusion. “Illusion” may be a misleading word. It makes it seem that there is something wrong about our common-sense views on time. There is nothing wrong with it. What is wrong is to think that this view must hold for the entire universe, or that it is valid at all scales and in all situations. It is like the flat Earth: Earth is almost perfectly flat at the scale of most of our daily life, so, there is nothing wrong in considering it flat when we build a house, say. But on larger scales the Earth just happens not to be flat. So with time: as soon as we look a bit farther than our myopic eyes allow, we see that it works differently from what we thought. This view passes the “common sense” test in the same way in which the fact that the Earth rotates passes the “common sense” view that the Earth does not move and the Sun moves down at sunset. That is, “common sense” is often wrong. What we experience in our “normal waking consciousness” is not the elementary structure of reality: it is a complex construction that depends on the physics of the world but also on the functioning of our brain. We have difficulty in disentangling one from the other. “Time” is an example of this confusion; we mistake for an elementary fact about physics what is really a complex construct due to our brain. It is a bit like colors: we see the world in combinations of three basic colors. If we question physics as to why the colors we experience are combination of three basic colors, we do not find any answer. The explanation is not in physics, it is in biology: we have three kinds of receptors in our eyes, sensible to three and only three frequency windows, out of the infinite possibilities. If we think that the three-dimensional structure of colors is a feature of reality external to us, we confuse ourselves. There is something similar with time. Our “common sense” feeling of the passage of time is more about ourselves than the physical nature of the external world. It regards both, of course, but in a complex, stratified manner. Common sense should not be taken at face value, if we want to understand the world. TH: But is the flat Earth example, or similar examples of perspectival truth, applicable here? It seems to me that this kind of perspectival view of truth (that the Earth seems flat at the human scale but is clearly spherical when we zoom out to a larger perspective) isn’t the case with the nature of time because no matter what scale/perspective we use to examine time there is always a progression of time from now to now to now. When we look at the astronomical scale there is always a progression of time. When we look at the microscopic scale there is always a progression of time. CR: What indicates that our intuition of time is wrong is not microscopes or telescopes. It’s clocks. Just take two identical clocks indicating the same time and move them around. When they meet again, if they are sufficiently precise, they do not indicate the same time anymore. This demolishes a piece of our intuition of time: time does not pass at the same “rate” for all the clocks. Other aspects of our common-sense intuition of time are demolished by other physics observations. TH: In the quote from your book I mentioned above, what are the “traces” of temporality that are still left over in the windswept landscape “almost devoid of all traces of temporality,” a “world without time,” that has been created by modern physics? CR: Change. It is important not to confuse “time” and “change.” We tend to confuse these two important notions because in our experience we can merge them: we can order all the change we experience along a universal one-dimensional oriented line that we call “time.” But change is far more general than time. We can have “change,” namely “happenings,” without any possibility of ordering sequences of these happenings along a single time variable. There is a mistaken idea that it is impossible to describe or to conceive change unless there exists a single flowing time variable. But this is wrong. The world is change, but it is not [fundamentally] ordered along a single timeline. Often people fall into the mistake that a world without time is a world without change: a sort of frozen eternal immobility. It is in fact the opposite: a frozen eternal immobility would be a world where nothing changes and time passes. Reality is the contrary: change is ubiquitous but if we try to order change by labeling happenings with a time variable, we find that, contrary to intuition, we can do this only locally, not globally. TH: Isn’t there a contradiction in your language when you suggest that the common-sense notion of the passage of time, at the human level, is not actually an illusion (just a part of the larger whole), but that in actuality we live in a “world without time”? That is, if time is fundamentally an illusion isn’t it still an illusion at the human scale? CR: What I say is not “we live in a world without time.” What I say is “we live in a world without time at the fundamental level.” There is no time in the basic laws of physics. This does not imply that there is no time in our daily life. There are no cats in the fundamental equations of the world, but there are cats in my neighborhood. Nice ones. The mistake is not using the notion of time [at our human scale]. It is to assume that this notion is universal, that it is a basic structure of reality. There are no micro-cats at the Planck scale, and there is no time at the Planck scale. TH: You argue that time emerges: “Somehow, our time must emerge around us, at least for us and at our scale.” As such, how do you reconcile the notion of emergence of time itself with the fact that the definition of emergence necessarily includes change over time? That is, how is it coherent to argue that time itself emerges over time? CR: The notion of “emergence” does not always include change over time. For instance we say that if you look at how humans are distributed on the surface of the Earth, there are some general patterns that “emerge” by looking at a very large scale. You do not see them at the small scale, you see them looking at the large scale. Here “emergence” is related to the scale at which something is described. Many concepts we use in science emerge at some scale. They have no meaning at smaller scales. TH: But this kind of scale emergence is a function solely of an outside conscious observer, in time, making an observation (in time) after contemplating new data. So aren’t we still confronted with the problem of explaining how time emerges in time? CR: There is no external observer in the universe, but there are internal observers that interact with one another. In the course of this interaction, the temporal structure that they ascribe to the rest may differ. I think that you are constantly misunderstanding the argument of my book, because you are not paying attention to the main point: the book does not deny the reality of change: it simply confronts the fact that the full complexity of the time of our experience does not extend to the entire reality. Read the book again! TH: I agree that common sense can be a faulty guide to the nature of reality but isn’t there also a risk of unmooring ourselves from empiricism when we allow largely mathematical arguments to dictate our views on the nature of reality? CR: It is not “largely mathematical arguments” that tell us that our common sense idea of time is wrong. It is simple brute facts. Just separate two accurate clocks and bring them back together and this shows that our intuition about time is wrong. When the GPS global positioning system was first mounted, some people doubted the “delicate mathematical arguments” indicating that time on the GPS satellites runs faster than at sea level: the result was that the GPS did not work [when it was first set up]. A brute fact. We have direct facts of evidence against the common-sense notion of time. Empiricism does not mean taking what we see with the naked eye as the ultimate reality. If it was so, we would not believe that there are atoms or galaxies, or the planet Uranus. Empiricism is to take seriously the delicate experience we gather with accurate instruments. The idea that we risk unmooring “ourselves from empiricism when we allow largely mathematical arguments to dictate our views on the nature of reality” is the same argument used against Galileo when we observed with the telescope, or used by Mach to argue against the real existence of atoms. Empiricism is to base our knowledge of reality on experience, and experience includes looking into a telescope, looking into an electronic microscope, where we actually can see the atoms, and reading accurate clocks. That is, using instruments. TH: I’m using “empiricism” a little differently than you are here; I’m using the term to refer to all methods of data gathering, whether directly with our senses or indirectly with instruments (but still mediated through our senses because ultimately all data comes through our human senses). So what I’m getting at is that human direct experience, and the constant passage of time in our experience, is as much data as are data from experiments like the 1971 Hafele-Keating experiment using clocks traveling opposite directions on airplanes circling the globe. And we cannot discount either category of experience. Does this clarification of “empiricism” change your response at all? CR: We do not discount any category of experience. There is no contradiction between the complex structure of time and our simple human experience of it. The contradiction appears only if we extrapolate our experience and assume it captures a universal aspect of reality. In our daily experience, the Earth is flat and we take it to be flat when we build a house or plan a city; there is no contradiction between this and the round Earth. The contradiction comes if we extrapolate our common-sense view of the flat Earth beyond the small region where it works well. So, we are not discounting our daily experience of time, we are just understanding that it is an approximation to a more complicated reality. TH: There have been, since Lorentz developed his version of relativity, which Einstein adapted into his Special Theory of Relativity in 1905, interpretations of relativity that don’t render time an illusion. Isn’t the Lorentz interpretation still valid since it’s empirically equivalent to Special Relativity? CR: I think you refer here to the so called neo-Lorentzian interpretations of Special Relativity. There is a similar case in the history of science: after Copernicus developed his systems in which all planets turn around the Sun and the Earth moves, there were objections similar to those you mention: “the delicate mathematical arguments” of Copernicus cannot weight as much as our direct experience that the Earth does not move. So, Tycho Brahe developed his own system, where the Earth is at the center of the universe and does not move, the Sun goes around the Earth and all the other planets rotate around the Sun. Nice, but totally useless for science and for understanding the world: a contorted and useless attempt to save the common sense-view of a motionless Earth, in the face of overwhelming opposite evidence. If Tycho had his way, science would not have developed. The neo-Lorentzian interpretations of Special Relativity do the same. They hang on to the wrong extrapolation of a piece of common sense. There is an even better example: the Moon and the Sun in the sky are clearly small. When in antiquity astronomers like Aristarchus come out with an estimate of the size of the Moon and the Sun, it was a surprise, because it turned out that the Moon is big and the Sun even bigger than the Earth itself. This was definitely the result of “largely mathematical arguments.” Indeed it was a delicate calculation using geometry, based on angles under which we see these objects. Would you say that the fact that the Sun is larger than the Earth should not be believed because it is based on a “largely mathematical argument“ and contradicts our direct experience? TH: But in terms of alternative interpretations of the Lorentz transformations, shouldn’t we view these alternatives, if they’re empirically equivalent as they are, in the same light as the various different interpretations of quantum theory (Copenhagen, Many Worlds, Bohmian, etc.)? All physics theories have two elements: 1) the mathematical formalisms; 2) an interpretive structure that maps those formalisms onto the real world. In the case of alternatives to Special Relativity, some have argued that we don’t need to adopt the Einstein interpretation of the formalisms (the Lorentz transformations) in order to use those formalisms. And since Lorentz’s version of relativity and Einstein’s Special Relativity are thought to be empirically equivalent, doesn’t a choice between these interpretations come down to a question of aesthetics and other considerations like explanatory power? CR: It is not just a question of aesthetics, because science is not static, it is dynamic. Science is not just models. It is a true continuous process of better understanding reality. A better version of a theory is fertile: it takes us ahead; a bad version takes no part. The Lorentzian interpretation of special relativity assumes the existence of entities that are unobservable and undetectable (a preferred frame). It is contorted, implausible, and in fact it has been very sterile. TH: But doesn’t the “inertial frame” that is the core of Einstein’s Special Relativity (instead of Lorentz’s preferred frame) constitute worse “sins”? As Einstein himself states in his 1938 book The Evolution of Physics, inertial frames don’t actually exist because there are always interfering forces; moreover, inertial frames are defined tautologically (p. 221). Einstein’s solution, once he accepted these issues, was to create the general theory of relativity and avoid focusing on fictional inertial frames. We also have the cosmic frame formed by the Cosmic Microwave Background that is a very good candidate for a universal preferred frame now, which wasn’t known in Einstein’s time. When we add the numerous difficulties that the Einstein view of time results in (stemming from special not general relativity), the problems in explaining the human experience of time, etc., might it be the case that the sins of Lorentzian relativity are outweighed by Special Relativity’s sins? CR: I do not know what you are talking about. Special Relativity works perfectly well, is very heavily empirically supported, there are no contradictions with it in its domain of validity, and has no internal inconsistency whatsoever. If you cannot digest it, you should simply study more physics. TH: You argue that “the temporal structure of the world is not that of presentism,” (p. 145) but isn’t there still substantial space in the scientific and philosophical debate for “presentism,” given different possible interpretations of the relevant data? CR: There is a tiny minority of thinkers who try to hold on to presentism, in the contemporary debate about time. I myself think that presentism is de facto dead. CR: The debate on the nature of time is very much alive, but it is not a single debate about a single issue, it is a constellation of different issues, and presentism is just a rather small side of it. Examples are the question of the source of the low initial entropy, the source of our sense of flow, the relation between causality and entropy. The non-viability of presentism is accepted by almost all relativists. TH: Physicist Lee Smolin (another loop quantum gravity theorist, as you know) argued views quite different than yours, in his book, Time Reborn, for example. In an interview with Smolin I did in 2013, he stated that “the experience we have of time flowing from moment into moment is not an illusion but one of the deepest clues we have as to the nature of reality.” Is Smolin part of the tiny minority you refer to? CR: Yes, he is. Lee Smolin is a dear friend for me. We have collaborated repeatedly in the past. He is a very creative scientists and I have much respect of his ideas. But we disagree on this. And he is definitely in the minority on this issue. TH: I’ve also been influenced by Nobel Prize winner Ilya Prigogine’s work and particularly his 1997 book, The End of Certainty: Time, Chaos and the New Laws of Nature, which opposes the eternalist view of time as well as reversibility in physics. Prigogine states in his book that reversible physics and the notion of time as an illusion are “impossible for me to accept” He argues that whereas many theories of modern physics include a reversible t term, this is an empirical mistake because in reality the vast majority of physical processes are irreversible. How do you respond to Prigogine and his colleagues’ arguments that physics theories should be modified to include irreversibility? CR: That he is wrong, if this is what he writes. There is no contradiction between the reversibility of the laws that we have and the irreversibility of the phenomena. All phenomena we see follow the laws we have, as far as we can see. The surprise is that these laws allow also other phenomena that we do not see. So, something may be missing in our understanding --and I discuss this at length in my book-- but something missing does not mean something wrong. I do not share the common “block universe” eternalist view of time either. What I argue in the book is that the presentist versus eternalist alternative is a fake alternative. The universe is neither evolving in a single time, nor static without change. Temporality is just more complex than either of these naïve alternatives. TH: You argue that “the world is made of events, not things” in part II of your book. Alfred North Whitehead also made events a fundamental feature of his ontology, and I’m partial to his “process philosophy.” If events—happenings in time—are the fundamental “atoms” of spacetime (as Whitehead argues), shouldn’t this accentuate the importance of the passage of time in our ontology, rather than downgrade it as you seem to otherwise suggest? CR: “Time” is a stratified notion. The existence of change, by itself, does not imply that there is a unique global time in the universe. Happenings reveal change, and change is ubiquitous, but nothing states that this change should be organized along the single universal uniform flow that we commonly call time. The question of the nature of time cannot be reduced to a simple “time is real”, “time is not real.” It is the effort of understanding the many different layers giving rise to the complex phenomenon that we call the passage of time. The first time I saw the double-slit experiment, I thought it was a trick, an elaborate construction with mirrors, cooked up by malicious physics teachers. But no, it was not, as I was soon to learn. A laser beam pointed at a plate with two parallel slits will make 5 or 7 or any odd number of dots aligned on the screen, their intensity fading the farther away they are from the middle. Light is a wave, this experiment shows, it can interfere with itself. But light is also a particle, and indeed the double-slit experiment can, and has been, done with single photons. Perplexingly, these photons will create the same interference pattern; it will gradually build up from single dots. Strange as it sounds, the particles seem to interfere with themselves. The most common way to explain the pattern is that a single particle can go through two slits at once, a finding so unintuitive that physicists still debate just what the results tell us about reality. The double-slit experiment is without doubt one of the most fascinating physics experiments ever. 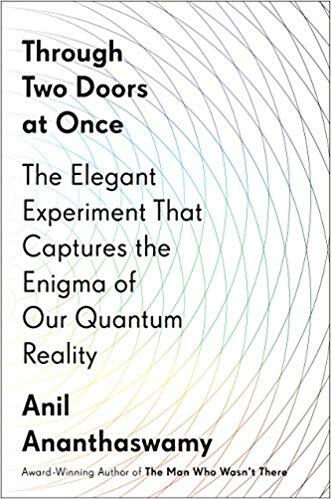 In his new book “Through Two Doors at Once,” Anil Anathaswamy lays out both the history and the legacy of the experiment. 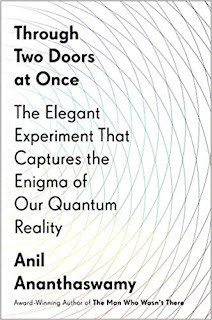 I previously read Anil’s 2013 book “The Edge of Physics” which got him a top rank on my list of favorite science writers. I like Anil’s writing because he doesn’t waste your time. He says what he has to say, doesn’t make excuses when it gets technical, and doesn’t wrap the science into layers of flowery cushions. He also has a good taste in deciding what the reader should know. A book about an experiment and its variants might sound like a washing list of technical detail with increasing sophistication, but Anil has picked only the best of the best. Besides the first double-slit experiment, and the first experiment with single particles, there’s also the delayed choice, the quantum eraser, weak measurement, and interference of large molecules (“Schrödinger’s cat”). The reader of course also learns how to detect a live bomb without detonating it, what Anton Zeilinger did on the Canary Islands, and what Yves Couder’s oil droplets may or may not have to do with any of that. Along with the experiments, Anil explains the major interpretations of quantum mechanics, Copenhagen, Pilot-Wave, Many Worlds, and QBism, and what various people have to say about this. He also mentions spontaneous collapse models, and Penrose’s gravitationally induced collapse in particular. The book contains a few equations and Anil expects the reader to cope with sometimes rather convoluted setups of mirrors and beam splitters and detectors, but the heavier passages are balanced with stories about the people who made the experiments or who worked on the theories. The result is a very readable account of the past and current status of quantum mechanics. It’s a book with substance and I can recommend it to anyone who has an interest in the foundation of quantum mechanics. Dear Dr B: Is it possible that there is a universe in every particle? I love the idea that there is a universe in every elementary particle! Unfortunately, it is really hard to make this hypothesis compatible with what we already know about particle physics. Simply conjecturing that the known particles are made up of smaller particles doesn’t work well. The reason is that the masses of the constituent particles must be smaller than the mass of the composite particle, and the lighter a particle, the easier it is to produce in particle accelerators. So why then haven’t we seen these constituents already? One way to get around this problem is to make the new particles strongly bound, so that it takes a lot of energy to break the bond even though the particles themselves are light. This is how it works for the strong nuclear force which holds quarks together inside protons. The quarks are light but still difficult to produce because you need a high energy to tear them apart from each other. There isn’t presently any evidence that any of the known elementary particles are made up of new strongly-bound smaller particles (usually referred to as preons), and many of the models which have been proposed for this have run into conflict with data. Some are still viable, but with such strongly bound particles you cannot create something remotely resembling our universe. To get structures similar to what we observe you need an interplay of both long-distance forces (like gravity) and short-distance forces (like the strong nuclear force). The other thing you could try is to make the constituent particles really weakly interacting with the particles we know already, so that producing them in particle colliders would be unlikely. This, however, causes several other problems, one of which is that even the very weakly interacting particles carry energy and hence have a gravitational pull. If they are produced at any substantial rates at any time in the history of the universe, we should see evidence for their presence but we don’t. Another problem is that by Heisenberg’s uncertainty principle, particles with small masses are difficult to keep inside small regions of space, like inside another elementary particle. You can circumvent the latter problem by conjecturing that the inside of a particle actually has a large volume, kinda like Mary Poppins’ magical bag, if anyone recalls this. Sounds crazy, I know, but you can make this work in general relativity because space can be strongly curved. Such cases are known as “baby universes”: They look small from the outside but can be huge on the inside. You then need to sprinkle a little quantum gravity magic over them for stability. You also need to add some kind of strange fluid, not unlike dark energy, to make sure that even though there are lots of massive particles inside, from the outside the mass is small. I hope you notice that this was already a lot of hand-waving, but the problems don’t stop there. If you want every elementary particle to each have a universe inside, you need to explain why we only know 25 different elementary particles. Why aren’t there billions of them? An even bigger problem is that elementary particles are quantum objects: They get constantly created and destroyed and they can be in several places at once. How would structure formation ever work in such a universe? It is also a generally the case in quantum theories that the more variants there are of a particle, the more of them you produce. So why don’t we produce humongous amounts of elementary particles if they’re all different inside? The problems that I listed do not of course rule out the idea. You can try to come up with explanations for all of this so that the model does what you want and is compatible with all observations. But what you then end up with is a complicated theory that has no evidence speaking for it, designed merely because someone likes the idea. It’s not necessarily wrong. I would even say it’s interesting to speculate about (as you can tell, I have done my share of speculation). But it’s not science. “Trostpreis” means “consolation prize”. This song was inspired by the kids’ announcement that we have a new rule for pachisi: Adults always lose. I think this conveys a deep truthiness about life in general. After I complained the last time that the most frequent question I get about my music videos is “where do you find the time?” (answer: I don’t), I now keep getting the question “Do you sing yourself?” The answer to this one is, yes, I sing myself. Who else do you think would sing for me?